You are here: Home / Manufacturing & Industrial Products / Viking Components, Inc.
Viking Components, Inc. designs, manufactures and distributes advanced technology products including computer system memory, flash memory and readers, and modems. Its customers are among the industry's largest resellers, distributors, and OEMs. After completing a financing that allowed Viking to expand its operations in the prior year, professionals of M&A Capital were engaged to pursue Viking's shareholder liquidity options with a targeted group of financial and strategic buyers. Professionals of M&A Capital generated alternatives for Viking's chairman Glenn McCusker, who selected a strategic buyer, Sanmina-SCI, as the most accretive. 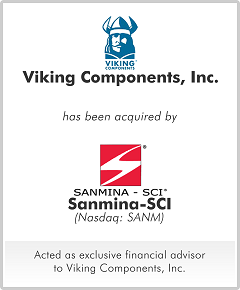 Combining Viking's advance technology with Sanmina-SCI's InterWorks subsidiary created an entity with expanded capabilities in supplying custom and standard modules and modular subsystems to the marketplace. The Viking premium brand combined with the benefits of leveraging the overhead of the two operations enhanced both businesses. The Company's advanced technology fueled significant increase in orders, requiring additional liquidity to support the Company's growth. Professionals of M&A Capital were retained to secure additional financing for the Company. M&A Capital evaluated a variety of options for the most cost effective and flexible solution. 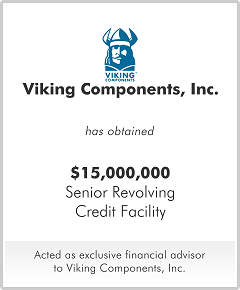 After receiving a variety of proposals, Viking selected a $15 million senior revolving credit facility with CIT Business Credit, enabling Viking to pursue its expansion.